ARCHIVE: IMTP for the first two weeks, after that just tell me where to send the child support payments. FEEDBACK: be brutal, this is what my insomnia lives for. DISCLAIMERS: I make no claims to the characters herein, I’m just abusing them to whittle away at the near catatonic lethargy brought about by the unrelenting desert induced boredom and too little sleep. DISCLAIMER: Thanks to Chris Carter’s All-Stars for playing on my diamond. 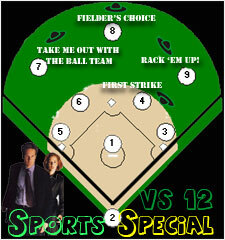 SUMMARY: Mulder and Scully get in the game when a serial killer tries to remove the Cubs from the spring lineup. DISCLAIMER: Mulder and Scully don’t belong to me. The location of this story and all the other characters, however, do. SUMMARY: Scully’s surprise rings less unexpected results for Mulder. FEEDBACK: Big hugs are offered in return for this holy gift! DISCLAIMER: None of the characters herein belong to me – all characters from The X-Files are property of CC, Fox, 1013 and co.; all baseball teams, players and field remain property of Major League Baseball and their affiliates. No infringement’s intended, and I guarantee I’m making no monetary profit for writing this. ARCHIVE: Two weeks exclusive to IMTP’s VS12, and then it becomes a free agent for anyone to host as long as my name stays attached. SUMMARY: She prays for the time when they can share a ‘normal’ day out together, but it looks like she’s not going to be answered today.